Agile Business Modeling – The Core Heuristic? How many times have I heard that the real problem with Agile is getting to the start line? There has to be some definition up front, but Agile methods don’t really help. Perhaps it’s a little secret for many organizations that they feel they must do more specification work up front because it makes it easier to control the Sprints. Oh dear! To get to this starting gate we need to model the agile business in an Agile manner (YES!). Further we do not want to undertake complete or detailed business architecture (NO!!). We don’t have time, and anyway the core of the innovation and architecture should be done in the Agile Delivery project. But before we can fire up Agile projects we need to determine the scope and charter. If we use conventional scoping methods we may well deliver great functionality very quickly, but we probably won’t, unless we are very lucky, have delivered agile business capabilities that map to the business dynamics and can evolve along with the business. Here’s a technique that may help. 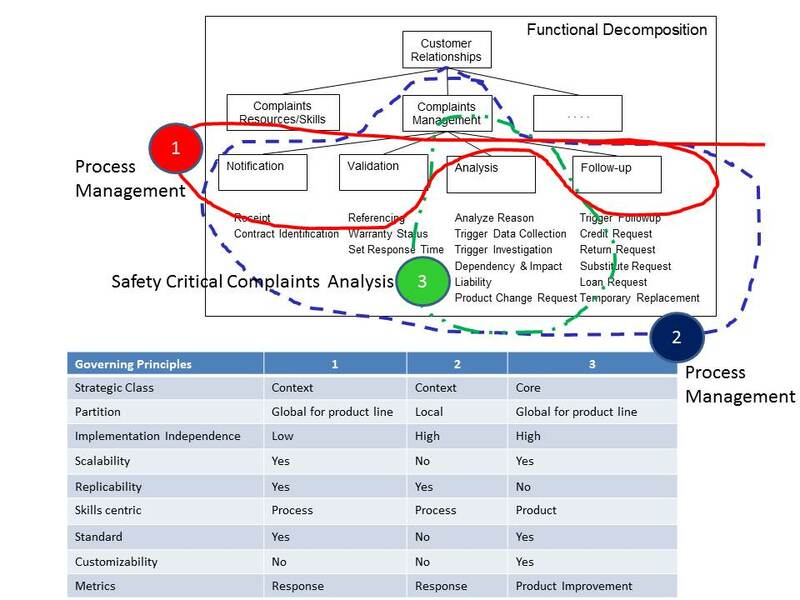 In the first image below I show a functional decomposition for complaints management which I have clustered into “candidate capabilities” labelled 1, 2 and 3, process management, customer relationships and analysis respectively. This usefully shows that capabilities can be varying levels of abstraction; there’s absolutely no necessity to have elegant models! The table below the decomposition shows various criteria I used to help me decide on the possible clusters. As you will see there’s variation in strategic classification; the partitioning – which may be key for deployment, some could be centralized others local; and the need for implementation independence and so on. This analysis certainly helps me present some choices. But aside from the independence and scalability criteria and possibly standardization criteria, I feel I have not fully exhausted the analysis of the need for business agility. In the table below I develop this a little further. First I make an assessment of the potential requirement for future change in each function. I call this Agility Potential (AP) on a 1=Low and 5=High scale . Not surprisingly Analysis and Skills are the capabilities that will probably be subject to considerable volatility. Second I look at the dependencies between the functions; note you have to read this as each row dependency upon a column. And low and behold, Skills and Analysis, and Analysis and Follow-up have high dependencies. This causes me to reconsider my initial cut of capability boundaries. I feel that Skills needs to be very close to Analysis as the investigatory function. And Follow-up should be similarly very close to Analysis. And what’s more these three functions score most highly on the AP scale. I feel Follow-up could easily be collapsed into Analysis, and a name change to Investigation would be perfect. I think a little more deeply about Skills. The degree to which the outcomes of Investigation need to be fed into Skills on a dynamic basis will vary depending on the type of business. If this was a safety critical business, I might recommend consolidating Skills and Investigation and renaming it Knowledge Management. But this really would depend on the business sector specific needs. To recap, what I have done here is developed a sharper understanding of the capabilities, and I have attributed them with governance criteria (in the first table) – I know what I must have delivered, and I am communicating some really important information to the delivery team, without constraining them at all on the implementation and delivery method. Also I now know the dependencies between the capabilities, and we can very quickly resolve the services that will be required and the inter project dependencies. And it didn’t take me very long at all. I first outlined the idea of Agility Potential in the CBDI Journal April, 2010. Let me know if you would like a copy. In December 2006 I blogged on the topic of Explaining SOA to the Business Audience. It started out “I note resurgent interest in LegoTM blocks as a metaphor for explaining to the business audience the value of SOA. My advice is don’t treat the business audience as dummies!” The blog goes on to explain business services using the Laundry metaphor, and how business people get the concept because they understand “services”. However, while my explanation was and remains perfectly OK, I will be the first to admit that I have moved on. The basic service model works perfectly, but in today’s fast moving, business innovating world, we need new vocabulary that is even more compelling, that goes beyond SOA and transactional efficiency. In their book Competing for the Future , Gary Hamel and C. K. Prahalad advise that traditional business responses to market and competitive pressure such as reengineering, downsizing and outsourcing are inadequate and insufficient. The outcome of this activity is typically just keeping one step ahead of declining margins and profits of yesterday’s business. Instead senior management need to get off the treadmill of restructuring and reengineering and instead reinvent their industry, imagining and creating their future. Business Service Operation: An execution of one or more capabilities provided by an enterprise to its ecosystem of customers, suppliers or partners according to a service contract. Example: Data load under Amazon EC2. In Table below I have summarized some of the Hamel Prahalad strategies and shown how these are implemented as Business Services. Hamel and Prahalad go on to pose the question, “Why did it take US automakers 40 years to decode the principles of lean manufacturing pioneered by Toyota?” Answer – because those principles challenged the core assumptions of US auto executives. I suggest we need to establish a business centric perspective of Business Service that is as closely linked to business offering implementation as it is to the internal SOA. This will cause us to challenge some of our core principles and assumptions. It’s NOT about LegoTM, it’s about business services and business agility. Have you noticed? Organizations have become initiative driven. Ten years ago enterprise architecture was topic de jour precisely because of initiative fatigue. But today there’s a huge focus again on narrow focus strategic projects and programs, because they are (perceived to be) the only way to deliver business change fast. Architecture, especially enterprise architecture, has become yesterday’s issue – primarily, many would argue because it failed to deliver the promised business agility. Challenging for the same mindshare but at the other end of the spectrum are Agile software development methods that bring an almost religious zeal to rapid delivery by concentrating responsibility on self-managing, cross functional teams. Don’t get me wrong, narrow focus teams are highly effective in solving complex problems that are intrinsically narrow in scope. The problem is that many enterprises are inherently complex, and well executed architecture is the only way in which complex problems can be broken down and structured in order to establish appropriately independent units of work that can be addressed in an effective manner using Agile methods. There have been several well intentioned attempts to evolve Agile methods to be effective in an enterprise context, to deal with the inevitable complexity that goes with very large scale operations that demand high levels of regulation, governance, scalability, standard services and business processes. But these efforts are unlikely to succeed because they approach the problem through the narrow lens of the Agile methods. At the same time we should observe that use of UML based model driven methods and tooling has not become widespread, as was once anticipated. Agile methods provide no guidance on “how” to undertake tasks and Agile practitioners by my own observation commonly reject the rigor of formal methods and tools. This single action without question limits the scalability of Agile projects making continuous change and iteration an effort intensive and lower quality activity. Many enterprises have voted with their feet and in their use of Agile methods have adopted a hybrid approach commonly referred to as Water-Scrum-Fall. In other words, architecture, planning and requirements are undertaken in the time honored fashion, and development is executed using Agile methods, typically Scrum. In truth, Water-Scrum-Fall should be designated an Anti-Pattern because it perpetuates the inefficiencies of early phases and renders the Agile development process sub-optimal because conventional levels of requirements errors and development and test driven rework persist. What’s happened is that Agile methods have in the main been adopted in a relatively uncritical and immature manner. It’s very noticeable that proponents of Agile methods strongly advocate adherence to the core concepts and methods, citing the transformational nature of the approach and the inherent dangers of compromise. 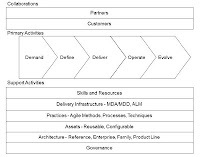 Yet there are examples of Agile being used effectively in large scale, but these are the exception, and have usually been achieved with either, exceptional levels of skilled resources, or more probably considerable customization of method, together with high levels of structure and tooling. 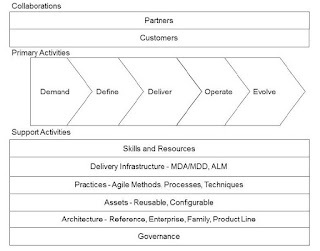 One must conclude that adoption of Agile methods remains at an early stage of maturity, and that like many new ideas in many domains, will be evolved by convergence with depending and dependent practices, which themselves must also evolve. 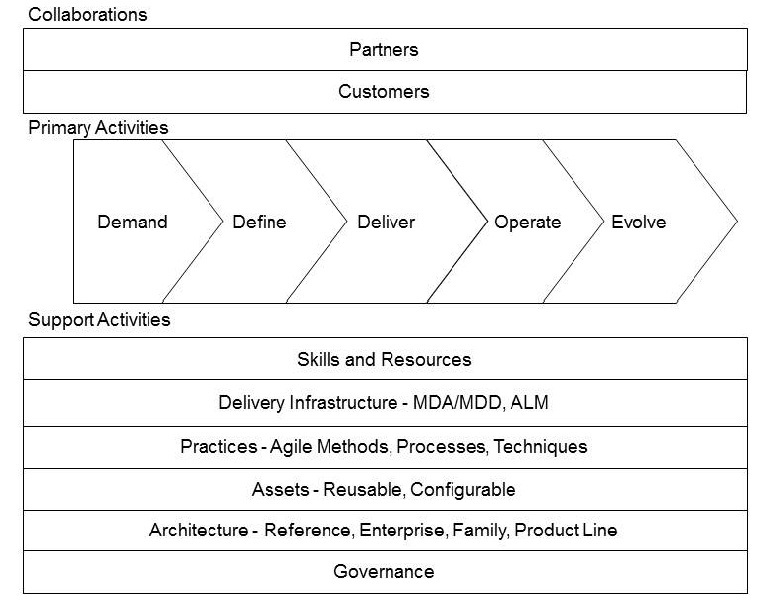 A practical way to manage this maturing process is with a value chain of the business change delivery cycle. Whilst architecture and structured methods and tooling are important as discussed, it’s clear there’s a larger ecosystem that Agile methods must collaborate with. This collaboration cannot be approached in a casual manner, it needs to be specified in detailed processes, practices and deliverables with appropriate automation to bring high levels of discipline to the end to end delivery process. It’s time enterprises applied the same level of process change effort to the IT activity that it does to the broader business. In this business improvement process it’s also important to note that Agile concepts can be productively applied to a broader range of activity than purely software development. And as with any value chain, there’s great opportunity to organize the supporting activities and leverage common practices, methods, resources and assets. The very pace of technology change means today’s enterprise is inevitably going to be initiative driven, but this doesn’t mean initiatives should be isolated in order to be successful – this is a path to delivering instant legacy. Rather Agile methods and concepts are effective Organizing and Management approaches, and they need to be integrated into the broader value chain, particularly architecture and life cycle automation, that delivers rapid business change. Talk to Everware-CBDI about the Agile Enterprise Workshop. This is currently available as an in-house, intensive workshop. Public scheduled classes will hopefully follow next year. Understanding Agility the Hard Way! Agility is one of those words beloved by software industry marketing people. Over time it has become almost embarrassing and meaningless. Yet if you are in doubt I suggest asking Eastman Kodak, RIM, Palm, Yahoo or Nortel what they think the term means…. Agility is one of those words beloved by software industry marketing people. Over time it has become almost embarrassing and meaningless. Yet if you are in doubt I suggest asking Eastman Kodak, RIM, Palm, Yahoo or Nortel what they think the term means. When you don’t have agility you understand it all too well. When all is going well investing for agility may seem a luxury. Why make capabilities genuinely independent so they can be switched in or out, or truly generic so they can be used in many different contexts if there’s no obvious or short term ROI? By the time you can accurately compute the ROI it will probably be too late.